I wouldn't mind the leisurely picturesque voyage had it not been towards a sudden end. Yet barring the discontent sensed by the climax, the other 115 minutes were well spent. 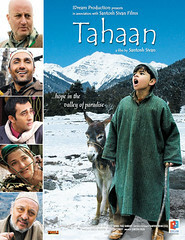 Tahaan's trailer looks so close to earth and has such a calm feel to it that it arouses curiosity. To add to it the story sounds like one of those that captures the world around a child through his eyes. A child who is barely surviving in Kashmir. The director's note captures it in this short sentence. I aim to explore and bring out the paradox of our times very stylistically. The bottomline is to be able to translate the directors vision into the visual. I'm always weary of any derivative of the word "style" in connection with a movie and that too when used by a director of photography. Style brings visions of slow-mo entries of stars. Not to mention, the not-so fond memories of his Asoka. But, I thought the trailer had a very Iranian cinema feel to it, only to find out that Santosh Sivan's earlier work The Terrorist has been compared to internationally acclaimed, Abbas Kierostami films. Now this prospect really excites me, because it promises to be something unlike the weekly humdrum of Hindi cinema. A carpenter, your mailman, friends - anybody can act in the film if they are game enough and have an interesting face. Financial constraints leave you with little choice. You can't change their basic persona, but they have to be dealt with a certain degree of sensitivity while facing up to the camera... ... Low budget films have this uncanny ability of turning non-actors into actors. We'll see how it all feels in just a couple more days. I completely relished the sweet time taken to establish little Tahaan's innocence and his harsh environment. I got fairly involved with the conflict gradually created because he's surrounded by people taking advantage of an 8-year old's gullibility. All this build-up towards a 5-minute climax? So sudden was the en, that people who might've fallen asleep because of the slow pace thus far, might even miss the climax. Yet, it didn't take anything away from a heart-warming performance by Purav Bhandare (Tahaan). The earnestness in his eyes in combination with his character's zeal was inescapable. I've become so used to seeing Anupam Kher in loud comedies, that any non-slapstick from him seems like a huge step in the right direction. So, though not his best, it's certainly one that makes most of the voice modulation he's capable of. This is the first time I've seen Rahul Bose play a non-city-bred character. In fact, he plays a village fool, if not the village fool. I'm still debating whether it's more because of how we are conditioned to see him that he doesn't seem convincing or it is indeed a role that he couldn't carry. Any which way, both the actor and the director need to be complimented for the experimentation. Sarika's grief-stricken eyes left me completely awestruck. And so did the cinematography. Kashmir's Pahalgam - the first time I saw snow and fell in love with it. Looks as beautiful now, as it was then. Only the houses look more rundown, the people seem poorer but have done their best to maintain the warmth inside. I guess visitors have to think twice before they can consider a vacation in Kashmir, where children play military-terrorist with their broken cricket bats. It might be fiction; it might be based on non-fictional situations. Either way, it's believable. Is it so easy to plant bombs? Or is this the film-maker's way of telling the people of Kashmir, "look at what you're doing to our children"
So, what do I give more weightage to - my disappointment with how the story loses its way or the beautiful photography? Why does it seem like the cinematographer Santosh Sivan took over the reigns from the writer Santosh Sivan? But, director Santosh Sivan seems to have done well with the actors, folk-based background score, art work, styling, and photography, of course. Was the aim to show the condition of Kashmir or to narrate the story of a brave boy? Maybe one through the other. Full points to the former and more than a little dissatisfaction with the latter. I'd give that extra point because the serenity of this one can only be enjoyed on the big screen. Tahaan, an 8-year old Kashmiri boy is attached to his pet donkey that has been gifted to him by his missing father. Due to the dire situation of his family, his mother has to sell the donkey off. Tahaan makes it the aim of his life to get his donkey back. Enjoyed the overall ambience created by the movie. The stylization of Idrees' character. The overdramatization didn't go at all with the tone of the movie. How come Anupam Kher's character doesn't hear the Idrees' whistle? Concept: A 8 year old child who lives a grim life makes 'staying with his only friend, his pet donkey' the aim of his life. The backdrop is Kashmir, so it’s has a very serious tone to it despite the seemingly flippant plot description. I was a bit disappointed. But certainly worth a watch. Vinayak has posted 1 comments and has rated 0 movies. See Vinayak's page for more details.